Upcoming events or fundraisers coming up at the temple. Follow this link to the registration form. Mark your calendars for the annual Bon Odori festival, July 21, 22. Join us for traditional Japanese dance, food, drinks, cultural displays, and a beer garden with live music and happy hour. Times are 4-10 p.m., July 21 and 3-8 p.m., July 22. Since Bon Odori is a Buddhist event, as always, each day’s dancing will be preceded by a short Buddhist service. New this year: Buddhism 101, brief lecture on Jodo Shinshu Buddhism right before the services. Dance practice dates: July 9-12, and 16, 17: 7:30 p.m.
You have multiple ways to get updates. 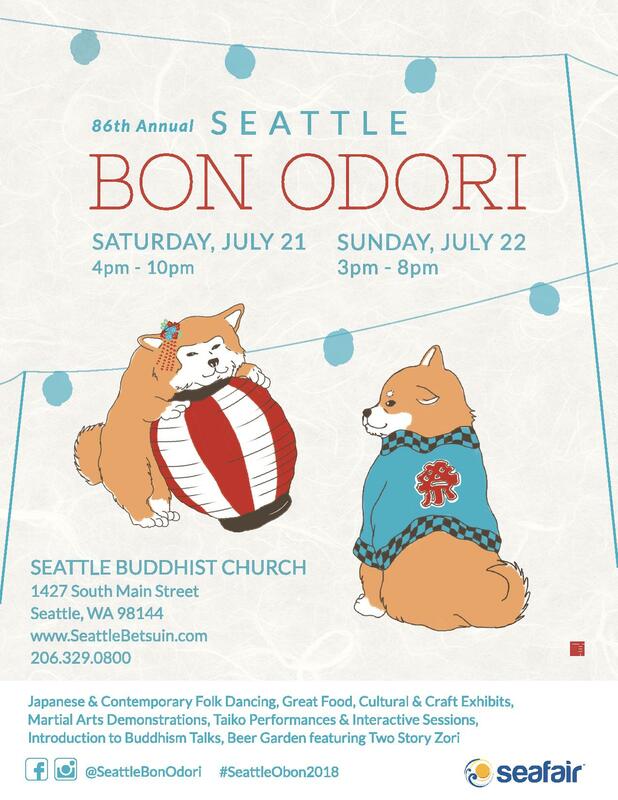 Follow us on instagram: @SeattleBonOdori and check us out on Facebook. Starting this month, we will have a slightly longer Sunday meditation period; instead of following the Sunday service as it has in the past year, it will happen before the service from 9 to 9:40 a.m.
Dharma School (Sunday School for infants/toddlers through high school) begins September 10. Guest minister Mas Kodani will give the Dharma Talk at the Ohigan (autumn equinox) service September 17. Clothing: underwear and bras, especially in larger sizes, socks, shoes, season appropriate clothing and coats. Personal Items: toothpaste personal size, toothbrushes, tampons, feminine napkins, travel size deodorants, hair brushes, combs and picks, soap, shampoo, hair care products, razors, tissue packages and nail clippers. Also, consider choosing items from this shelter wish list. On Saturday, September 16, White River Buddhist Temple is offering a Body and Mind Seminar, from 8:30 a.m. to noon. Susan Gilkey, M.D. and minister’s assistant at Chicago Buddhist Temple, will offer a two-part session of yoga exercise and meditation. Following this, Dr. Gilkey and Rev. Koshin Ogui, former bishop of the Buddhist Churches of America and retired resident minister of White River, will give a joint Dharma talk. Program is free, but donations are encouraged. See link for more information and registration form.